Monday October 24th 1921 It was a nice day. We did the washing. I was home all day. Did some sewing. Hattie to Shakespeare Club in PM. Tuesday October 25th 1921 We left at ten oclock to drive to Mt Vernon. Emily called where her Uncle had died. Rob drove and Hattie Fannie and myself were along. We went on to Cedar Rapids and had dinner at "The Montrose." Did some shopping and came on home. Spent evening at home. Wednesday October 26th 1921 We did ironing in forenoon. I sewed some. Hattie knitting on my sweater. We went down to Fannies to a little party in the afternoon. Our supper was late. The folks from the other house come up in the evening. Thursday October 27th 1921 I was sewing some in forenoon. Hattie to a luncheon about three oclock Rob came for me and we got Hattie and Mrs Sheldrick and went to Cedar Rapids to meet Cora. We had a nice supper after her train came in and got home about 9.30. The roads splendid. 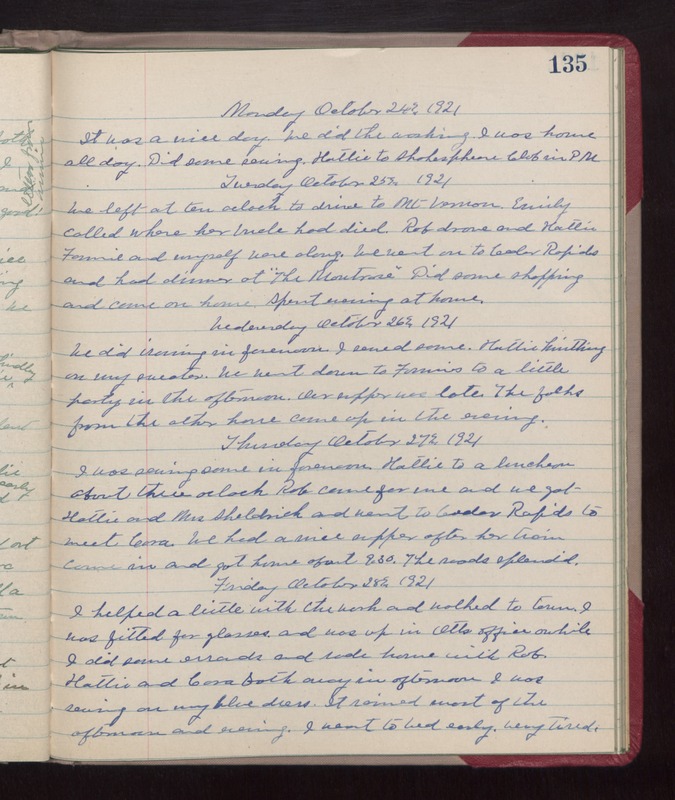 Friday October 28th 1921 I helped a little with the work and walked to town. I was fitted for glasses and was up in Otts office awhile. I did some errands and rode home with Rob. Hattie and Cora both away in afternoon. I was sewing on my blue dress. It rained most of the afternoon and evening. I went to bed early. Very tired.